Would you rather have a great wine that wasn’t a classic example of it’s place (the ‘t’ word)? Or would you go for a staunchly regional wine, warts-and-all? In the case of a friend and I last week, we went for the great wine: El Puntido. The problem is it’s not what I call classic Rioja by any stretch. Indeed, one look at the label and it looks like a high-school art project of the 1980s (is it a symptom of my impending middle age that I stoutly refuse to take a photograph on a label seriously? ), but it was one of those wines I instantly liked and, judging by the people I’ve met recently who have tasted it, I’m not alone. Luckily for the people behind it – the Eguren family, an impossibly wealthy Spanish dynasty who brought you the likes of Sierra Cantabria, San Vicente, and Termanthia/Numanthia before it was sold to LVMH for enough money to make a Greek economist blushÂ – I hadn’t seen the label before tasting the wine. Eduardo Eguren was presenting some of his family’s wines at an evening in Zamora earlier this year and, while I was impressed by their new Toro project (Almirez, Victorino, and Alabaster are the wines – the latter is fantastic but you mustn’t buy it because no-one should be encouraged to make wines that expensive), it was El Puntido that I liked most. The wine, I admit, was as polished as Eduardo’s presentation (and hair) and while the journalist in me cannot help but dig a very big trench when these big groups muster the powerpoint pages and send the charm battalions forward, I found myself liking a wine that has little to do with Rioja but everything to do with being enjoyable. So I took a bottle round to a wine-loving friend in London, along with a dvd of The Life Aquatic. In terms of her enjoyment, I have a feeling the wine slightly pipped the film (it also beat a Ribera del Duero we opened – Vina Pedrosa, La Navilla, 2005 – which boasts the same alcohol as the Puntido, but, we concluded, showed it off more). 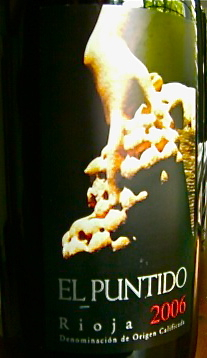 El Puntido 2006 is doubtless a great wine. But on the label it also says ‘Rioja’ and I’m not so sure I’d be happy calling it a great Rioja. But does that matter? TN: Dark, brooding fruit with a sweet edge and a hint of what might well be some Spanish earthiness on the nose, I’d have difficulty, blind, pinning this wine on Rioja. So smooth and yet so complete on the palate, it seems to have a judicious balance of everything: fruit, tannin, alcohol and freshness (despite the 14.5% stated on the label). Long, enjoyable – but relatively serious at the same time – this wine is a pleasure to drink. Can be enjoyed with pretty much any hearty food or, in my case, on its own with a Wes Anderson film.